It's Monday...so you know what that means! 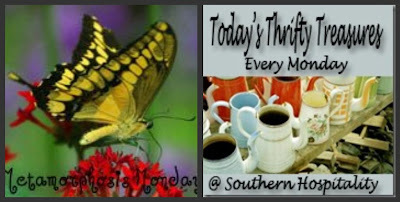 It's time for Metamorphosis Monday with Susan at Between Naps on the Porch and Today's Thrifting Treasures with Rhoda at Southern Hospitality! So I'm doing a twofer...I'm going to show you a few thrifting treasures and how I have used them in my home! Please be sure to visit these two delightful hostesses to see some wonderful before and after projects and some fabulous thrifting finds! I have just returned from meeting Barb at Grits and Glamour and Kathysue from Rate My Space in Asheville, NC! I will be telling you about our meeting on Tuesday, but for today, I want to show you my finds while shopping with them! You know that serious Goodwill hunters have to check out the GW in a new city, so off we went! Kathysue was the treasure hunting bloodhound, since she was traveling by plane and couldn't pack a lot. Look what she found for me! It's an antique Nippon plate! It's worth your time to enlarge the photo if you are a lover of plates like me! Do you see all of the wonderful gold beading?? This one will go on the wall in my bedroom! The mark says "Hand Painted RC (Royal Crockery) Nippon"! I found a similar plate with the identical mark online from the estate of a 91 year old woman...being sold for $24. I paid...are you ready?...50 cents!! Wooooo hoooo!!! I found this framed print for $7.00 last week at a GW near me. I am showing you a picture of it that I copied online because I can't photograph art to save me! It's a French poster by René Pean from a series encouraging train travel in the 1920's. 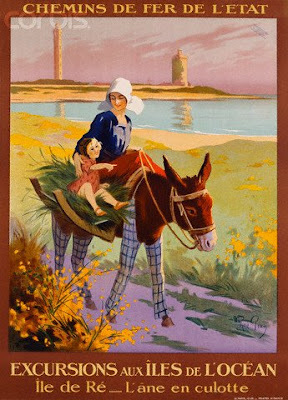 This one depicts Ile de Ré...and do you notice anything?? The donkey is wearing trousers...l'âne en culotte! I love it!! 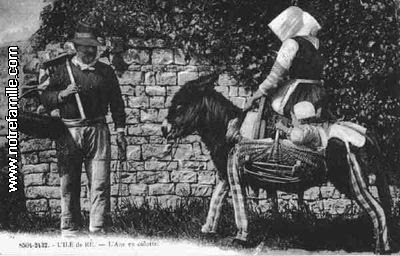 It was actually the custom to put trousers on the special breed of donkey that is raised there. It's a farming region near a marsh and the trousers protect the donkeys from insect bites! Don't you love the little girl riding in the basket? So now you are wondering...where is the metamorphosis??? First, I must show you a planter that I found at TJ Maxx a while back. As soon as I saw it, the little wheels in my head started turning! Doesn't it look so rustic and frenchy? 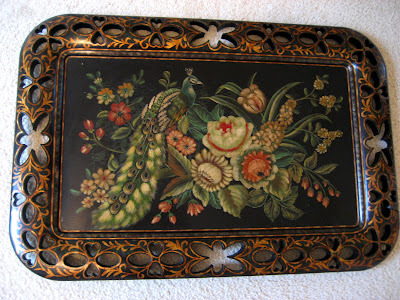 Then while I was in Asheville, I found this gorgeous tray at a consignment shop. It looks like tole, but it is actually made of wood. I love the colors and the intricately carved cut-outs around the edges! Do you see where this is going??? ...I am being very brave and showing you the beginnings. This is definitely a metamorphosis in the works! Maybe this will inspire me to finish it! As you can see, the border has to come down and the paint color has to be chosen. Have you ever had a mess like this? I am leaning toward the second one from the left...Palmetto from Ace. What do you think? Or maybe the third from the left...Lewiville from Benjamin Moore. OK...now that you have seen my dirty little secret, I will be forced to finish! Thanks for dropping by! Please be sure to visit Susan and Rhoda to be inspired by more projects and thrifting finds! See you next time! A bientôt! Beautiful! I love your new nightstand! I love the donkey in trousers!! Your Nippon piece is quite a treasure. We just got back from Destin and my poor husband. I made him wait on me as we went through every nook and cranny in not one but 2 GW stores. Everything was so overpriced! The antique stores in Destin were cheaper!! Lesson learned - In tourist towns, even Goodwill Stores mark up the prices! We only had time for Screen Door and the Farmer's Market when we were in Asheville. We toured Biltmore, then the next day, we went to Screen Door. On the way home we stopped at the market. It was December; no fresh produce, but fun, just the same. The plate is gorgeous and I love what you did with the tray and stand. Looking forward to the redo. I loved the way you made a night stand out of the beautiful tray and planter. It's lovely! How much fun- a real face to face meeting and treasure hunt. There was not a single color painted on the wall that I didn't like and the plate you bought ..was just gorgeous! I missed my garage sales this weekend..but next week end I will back at it. Debbie- THat plate is absolutely gorgeous!!! What a find indeed!! Love the endtable tray idea- very clever! Oh, I love the tray and stand. What a unique nightstand you have now! I also really like the second green from the left. Oh Debbie...it sounds like you girls had a wonderful time. I can't wait to here all about it!!! All the goodies you found are beautiful. My favorite is the tray!!! I want it!!! It is sooo gorgeous!!! I love it on the stand you found but I would love it more at my house;)!!! The color you like for your room is the one I would choose as well...such a pretty green. I can't wait to see what you do with the room!!! This was such a fun post!!! I am glad you are home and that you enjoyed your trip!!! my Mr.Grady Tucker..nah - I don't think he would like them - he likes being neked....lol !The tray transformation looks great....don't you love putting stuff together ? Oh what a great post...so many exciting things at once! Love the plate, fascinating to know donkeys wear trousers and why (I had no idea! ), and since green is absolutely my favorite color to decorate with, I can't wait to see this room finished. Hurry! hurry! I know it will be spectacular. The donkey in trousers was a first for me - Thanks for the history lesson!! Love your GW finds and a very cool nightstand! Good Luck painting your bedroom, can't wait to see the final product! Love the tray! And that plate for only fifty cents!!! Wow~! I had to show my granddaughter the donkeys in pants! SHe is still giggling! Your tray and planter project is prefectly pretty! Oh... "Palmetto" is really pretty! Excellent finds! I really enjoyed learning about the donkeys wearing trousers. How funny. :) Your guest room will be beautiful. I have no doubts! 1. I wish you had been my French teacher -- I might be able to speak French today. 2. I saw a donkey like this somewhere years ago on my first trip to Europe. I think itmight have been in Spain? 3. Plate is fabulous. I'll take it when you are tired of it. 6. I chose the same color you did before I saw your pick! I like all those colors except the first one on the left. Too cool for me. I want that plate!! I hope John gets my shutters down this week so I clean paint them. I mean so I can paint them. Oh fabulous! Your plate is gorgeous. I so love finding treasures like this at Goodwill or other Thrift stores. What great vision you had to use that tray with the table. Very nice!! Hi Debbie, please come to my house so you can give me ideas on freshening things up! Love all your great finds and ideas. Hello Dear Friend - oh that tray is perfect!!! That consignment store was the bestest of our stops, by far. I wish everyone could have seen the excitement on your face when you spied that tray. Ok, on my screen I like the center color best. But, you have excellent taste so you will make the right decision and it will be grande. I can't tell you what a blessing it was to meet and spend two wonderful days with you and Kathysue. Treasured memories indeed. I like all the color choices so I am no help, but I look forward to see where you're going in your bedroom. I'm sure it will be adorable! I love that tray! What a great idea for a nightstand. Re; the paint color, I like all of them. I'm such a help, huh? I like either your choice or the 3rd one over from the left best though. Love the new nightstand and the simplicity of creating it. The donkey with the trouser?? How cute is that!?! You found the most fabulous treasures! The plate is gorgeous & I thought of it hanging on the bedroom wall before I read that's where you going to hang it! I had no idea that donkey's have ever worn trousers! What a hoot! Love the pictures, but it's still pretty funny, althought practical! The tray & stand are just to amazing! Lucky you! That plate for 50 cents is fabulous! Love what you did with the stand and tray! I always have to check out the thriftstores when were traveling! A 50 cent plate that beautiful? Great find! And that tray! Holy Smokes I would love to find that tray at most any price. Great look as a nightstand on your TJMaxx stand. Your new room will be so gorgeous, I just know it! Hi, Debbie! I am visiting from Rhoda's. That plate is a real find! My in-laws used to deal in antique china, so I know you got a great deal. I love that tray you found, and what a good idea with the plant stand. I think your room will look really good when it's all done. BTW - your CEO looks just like one of my cats, Slimmys. The plate you found is beautiful. I especially like the raised gold detailing. Those are some great finds and that plate is simply gorgeous! Debbie, I saw that fun shopping trip you girls just had & I know you had a blast! What fun it is to get together with other bloggers & shop. Great finds! I love your little nightstand that you put together, it's genius. I appreciate you coming by to see me so often too. I have met so many great friends since I started blogging. Very creative. Come by to see my transformation! If you like what you see, please subscribe to my blog in the right hand column. Just hit the word "Follow" and stay updated on lots of great tips! LOVE the donkey with trousers! I so wish I could meet some of my online friends! My husband calls you guys my imaginary friends as I talk all about you guys all the time! great finds and what a cool nightstand! What a clever idea I love it, the tray is so colorful and I love color. Can't wait to see your redo. The plate was a real find, a real treasure and you had fun finding it with another blogger. How fun to meet some blogger friends. I love, love, love the plate and the nightstand that you made with the tray. Thanks for sharing. I love getting to see all the fabulous finds. Even if I get a little jealous sometimes. Love the donkey lesson. I had no idea that donkeys ever wore trousers. Hilarious! And the little kids in the baskets are precious too. 1) thanks for the french lesson. Who knew? Not me! 2) Love the tray idea. Great idea for a side table. 3) Those were the two colors I picked out on your wall, too! Can't wait to see the finished room. Now if I would just get around to finishing my guest room!! Oh you stole that plate! LOL.I always buy Nippon,love it.That was a steal! I never knew that Donkeys wore britches! I always learn something from reading your blog. Thanks for stopping by today - I actually did think of you when I first saw that tureen! I knew you would love it. Great scores! I love the table idea. I recently did something simliar with a suitcase & luggage stand bought at two different yard sales a few weeks apart. Funny how that all works out! I love reading these blogs and learning something new. 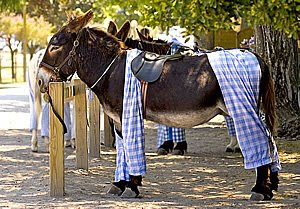 Donkeys wore trousers, how cute, but also how practical and it makes sense. Poor guys and all the insect bites! I wonder what wonderful stories it could share. That is truly a treasure! Love reading and catching up, I am jow going for tea with my older cousins - I will share the donkey in trousers story. That is one of the most beautiful trays I have ever seen. Great plate. Can't go wrong with pink and green color combo. Now those are some cool trousers! lol I love the little prints! I adore your idea with the plant stand and the tray! I did laugh at the paint, I like the second one too! I have a head board painted in 3 green shades. I I mixed paint for the dining room and had two wall covered in sample colors! I finally gave in and went with the last one I mixed, it is like real butter color. I can't wait to show you my dining room! I working hard on it. It was to be formal, lol I gone far away from formal. What does Rue mean in French? Hi Debbie, yes, I saw the tray and it is lovely, especially with the cut outs on the border. I would have bought tht too if I saw it. I know the peacock rings are not the same but they look similar,aren't they, just looking a different direction.